Nearest weather station, with distance and direction from RNA: The nearest weather station is at Idabel, Oklahoma, approximately 20 miles (32 km) west of the RNA. Annual precipitation (type, seasonal distribution): The wettest period occurs in the spring, and the driest time is in the fall. The highest total precipitation recorded from 1945 to 1975 was 73.4 inches (186.4 cm) in 1957 and the lowest was 30.5 inches (77.5 cm) recorded in 1956. Maximum and minimum temperatures: The area is characterized by long, hot summers and mild winters. Prevailing winds are from the south. The mean temperature in January, the coldest month, is 43.1°F (8.2°C) and the mean temperature in July, the warmest month, is 81.5°F ( 27.5°C). Elevation: The RNA is on relatively flat land, with elevation ranging from 330 to 350 feet (100.6 – 106.7 m). Geology and Soils: In the Tiak RNA, alluvial deposits overlie the bedrock. Bedrock in southern Mc Curtin County consists of sedimentary rocks of the Comanche and Gulf series of the Cretaceous system. The soil of the proposed Tiak RNA belongs to the Guyton series. The Guyton series consists of deep, nearly level, poorly drained soils on flood plains and terraces. Aquatic Features: The Tiak RNA is in a relatively flat bottomland hardwood forest that is occasionally flooded. Watershed values of the area are high, since rainfall in the area is relatively high and forested wetlands absorb water and release it slowly. Plant Communities: The entire area is forested, and there has been no cutting in the last sixty years. Canopy dominants include: water oak (Quercus nigra), and cherrybark oak (Q. falcata v pagodifolia), which are more numerous in the drier areas and willow oak (Q. phellos), more numerous in the wetter areas. 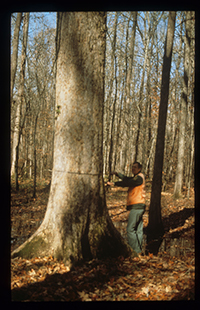 Sweetgum (Liquidambar styraciflua) is a sub-dominant. At Risk Species: No known endangered or threatened plants or animals are known to exist within the RNA. Partridge berry (Mitchella repens) and Nuttall oak (Q. nuttallii) are sensitive species with five or fewer occurrences in the state. The crane-fly orchid (Tipularia discolor), also known from five or fewer occurrences in Oklahoma, was recently discovered in the RNA. Common Shrub Species: Trees and shrubs in the midstory include: American holly (Ilex opaca), flowering dogwood (Cornus florida), red maple (Acer rubrum), eastern hophornbeam (Ostrya virginiana) and river birch (Betula nigra). Hoagland, B. W. and N. A. McCarty (2009). “Composition and structure of bottomland forest vegetation at the Tiak Research Natural Area, McCurtain County, Oklahoma.” Oklahoma Native Plant Record 9(1). Hoagland, B. W. and N. A. McCarty (2009). “Composition and structure of bottomland forest vegetation at the Tiak Research Natural Area, McCurtain County, Oklahoma.” Oklahoma Native Plant Record 9. Melhop–Cifelli, Pat (Oklahoma Natural Heritage Commission). 1987. Report on the Tiak area. Unpub. Ms.